Hello again, blog. This bird has hitched a lift with his furry friend, who is off on an adventure into the unknown. We're on our own kind of adventure at the moment - about to move house after seven years of being very nicely settled, thank you. Finding new work after two months of making theatre. Everything's up in the air, and in the middle of it, L fell off a jungle gym (playing tag on it, as you do) and broke his arm once again. 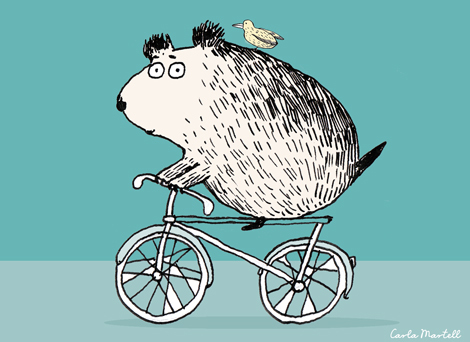 It's been madness, and I'm glad to be back here again, in this sedate little world of animals and birds on bikes. Oh my goodness, I hope things settle down soon! Cute furry guy! Guinea pig, perhaps? This illustration is delicious, I love it! but hey, time goes fast, right? I am sending you a hug! I love it! I think the unlikely pair are going to have a great adventure and I hope yours is too! cute :) Good luck with the house search. I hope things settle for you soon. Yikes! Glad you can escape by "doodling away"! Love the look on the faces! Those darn lazy birds. Cool style! Doesn't look like a very fast way to travel (I doubt that big, furry friend can peddle very fast), but it sure seems convenient! So cute - that's great that your illustration can be a place that gives you time to take a break! What fun characters! I want that bicycle. Can I borrow it till the next IF prompt? Love the humour made me smile...kids!! My stress me out everyday!